Port wine stain birthmarks: These are flat reddish marks which are usually present at birth but disappear with age. Strawberry birthmarks: These are the most concerning category of birthmarks. Although they start appearing as a flat reddish mark, they can soon harden and develop ulcers. Their early diagnosis and treatment, therefore, becomes of utmost importance. Also known as haemangioma, these marks have associated symptoms such as feeding disability and loss of vision if not diagnosed and treated timely. Spider birthmarks: These birthmarks look like reddish spots and are only superficial or in the epidermal layer. Brown birthmarks: These birthmarks are formed by accumulation of melanocytes like a cluster in a specific area and produce excessive amount of melanin or skin pigment. Vascular birthmarks: These are caused by malfunctioning vasculature and generally get darker or more pronounced with age. 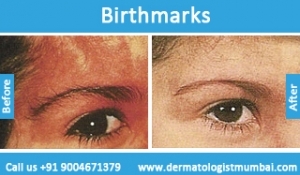 Pigment birthmarks: These are caused by excessive melanin production in a localized area and don’t produce any other symptoms. These also tend to fade with age. Q switched lasers: This treatment is recommended for dark pigmented birthmarks. The laser penetrates the epidermal and dermal layer, to break down melanocyte action and reduce melanin production. It results in gradual skin lightening and fading of pigment birthmarks. 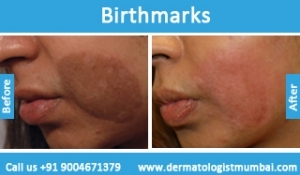 Pulse-dye lasers: This treatment is highly effective in case of vascular birthmarks. As the culprit is vasculature and not melanocytes, the action of this treatment varies from Q-switched lasers. 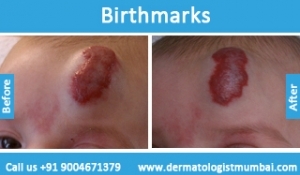 A good amount of intense pulse light is aimed at the area affected with birthmark to alter the malfunctioning vasculature and result in subsequent de-pigmentation. Dermatological surgery: This procedure is adopted in case hemangioma is left undiagnosed and grows to the stage of ulceration, thereby obstructing the activity of adjoining organs. To effectively restore normal body function, surgery is recommended instead of laser treatments. 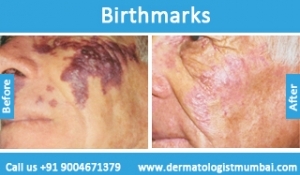 We understand that choosing to get a birthmark removed is an important step in anyone’s life. And while there are many underlying psychological factors, the treatment is heavily dependent on the physical composition of your skin. 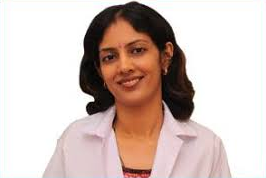 Our co-founder, Dr. Rinky Kapoor is a celebrated Dermatologist in Mumbai, India and is trained as a Cosmetic Dermatologist, Cosmetologist and Trichologist from the National Skin Centre, Singapore & the Stanford University, USA. Every patient, therefore, receives a highly customized treatment yet. We recommend that you call our The Esthetic Clinic helpline to arrange for a comprehensive evaluation. Today, laser removal therapy is the buzzword in cosmetology. If you have a birthmark you don’t like, then laser removal performed by Dr. Rinky Kapoor at The Esthetic Clinics, will get rid of it for you. Laser removal is non-invasive and cost-effective. 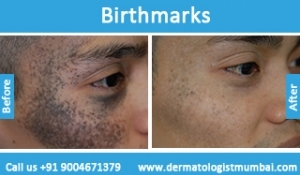 Laser removal not just gets rid of birthmarks, but tattoos as well. 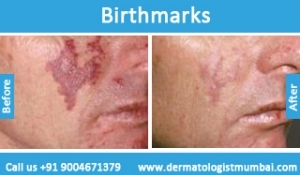 With laser removal, you can get rid of unseemly birth marks once and for all with ease. Your local skin clinic, like The Esthetic Clinics, is the best place to ask about laser removal for the birthmark. Since laser removal is non-invasive, it is painless as well. Getting laser removal done does not have to take up a lot of your time, but it will take a few sittings with Dr. Rinky Kapoor. Don’t live with your unwanted birth mark any longer; get laser removal today at The Esthetic Clinics!